Six bushels of Concord Grapes were picked from a local commercial site and processed into about 90 liters of pressure canned juice. Cost was $20.00 per bushel. The grapes are superb quality this year. The seeds were subjected to a new press to remove all the juice.The process was wash, remove the grapes from their substrate, cook, put through food mill to remove seeds, Pressure Can at 15 PSI for 15 minutes for long term storage. Processing was done in bushel lots. Concord grapes make a most pleasant beverage. 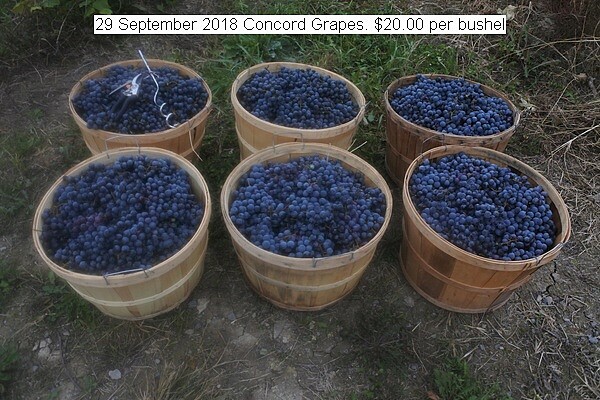 This entry was posted in Uncategorized and tagged 29 September 2018 Concord Grape, Pessure Canning Concord Grapes. Bookmark the permalink.